Laser teeth whitening allows us to whiten your teeth for as much as 8 shades in just one visit. Our Office in Milton offers some of the best Dental Care treatments and services. A rubber substance will be put over the teeth to protect the gums. Next, a bleaching product will be applied by painting on the teeth. A laser beam is then passed on to the teeth which activates the chemicals form the bleaching product and hence make the teeth glow. Here is an image to give more insight on how the teeth change color and show effective results almost instantaneously with this methods of laser teeth whitening. 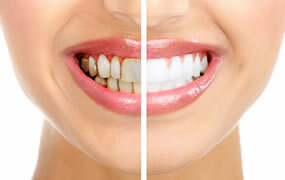 We can assure you at least 8 shades whiter teeth with laser whitening. Our methods ensure that you experience minimal irritation altogether. All this will be done in exactly one visit. The maximum period of operation would be between half an hour to one hour. Also, at Sapphire Dental Centre, Milton we offer a free consultation for every incoming patient if they so require. This free Oral Consultation report also includes Full Mouth X-Ray and Treatment Plan in case the patients would like to have some work done on their teeth.